Indigo is an intuitive to use diagnostic tester that can be easily configured without diagnostic protocol knowledge. Indigo is suitable for both vehicle development and workshop use. Indigo provides a quick overview of the status of a vehicle and also allows detailed diagnostics of individual ECUs. Various tester configurations can be defined, saved as projects and securely exchanged between partners. Remote diagnostics with Indigo Remote is also possible. With Indigo, the user has access to the complete OBD test scope. In addition, Indigo can be parameterized via a diagnostic description file. This gives the user access to OEM-specific diagnostics as well as individual network signals. Indigo features a variety of predefined diagnostic tools that can be used in any project. The results of diagnostics are clearly displayed and their interpretation is available in clear text. The user saves repetitive tasks in diagnostic scripts (VDS - Vector Diagnostic Script) and simply executes them again as required. With Indigo, projects can be created for different diagnostic protocols such as UDS, KWP, OBD or J1939. All typical diagnostic communication protocols such as CAN, K-Line or DoIP are supported. Communication with the vehicle takes place via a network interface (Vector, PassThru or D-PDU API-based interface). Indigo is ideally suited for diagnostics of an entire vehicle during testing and especially in the workshop. In addition, Indigo allows users to diagnose individual ECUs in a laboratory environment during the development of vehicle diagnostics. The user interface can be freely configured for different diagnostic tasks using predefined tools from a toolbox. Several instances of a tool can be selected and named freely. The user saves the resulting user interface together with the diagnostic description files as a project or as Pack&Go to exchange it easily with his development partners. Encryption in the form of a protected project is also possible. In this case the configuration can neither be changed nor the contained diagnostic description files can be viewed. Thus only the execution of the predefined functions is possible. For use on test drives, Indigo can be operated easily and quickly via keys. The measurement of data or readout of error memories can thus be triggered and recorded data can be temporarily stored for later analysis. For documentation purposes, the user generates reports in a clear and adaptable form with Indigo. Indigo Remote can be used wherever an expert needs to access a vehicle directly from a distance using remote diagnostics. All confidential data remains on the expert system and is not transmitted to the vehicle. The remote functionality is already integrated in Indigo, but is only activated with a special Indigo Remote license on the Expert PC. With a single Indigo Remote license, any number of access points can be accessed one after the other. Only one Indigo Access Point needs to be installed on the remote PC. This is available here free of charge. Indigo now offers an extension for developing and testing diagnostic sequences for Microsoft Visual Studio. The advantages are comfortable editing, easy testing of diagnostic sequences and best debugging support. Integration of the Vector Security Manager. The Vector Security Manager provides manufacturer-specific security functions, e.g. for gateway authentication. DTC Auditor (OEM specific and J1939): Graphical overview of all connected ECUs and their fault memory status with color coding. The update interval is adjustable. Identification Browser (OEM specific and J1939): Acquisition of general information about the installed ECUs (e.g. serial number, version, VIN, ...). Parametrizer: Reads or changes selected parameters. The entries are checked before writing. Existing values can be restored if necessary. (Graphical) Live Data: Measurement of diagnostic data and CAN signals. The display can be either tabular or graphical. The measured values can be symbolically logged into CSV or MDF files (from Indigo 6 on) to be processed later by further tools. IO Control Center: Convenient control for selected actuators in the ECU. Routine Control Center: Start or stop the execution of remote routines (UDS service 0x31) and query the result of the routine. Quick Check: Display of a cross-vehicle identification data record as well as the number of DTCs per ECU. The data set is uniform across all ECUs, but can be adapted. 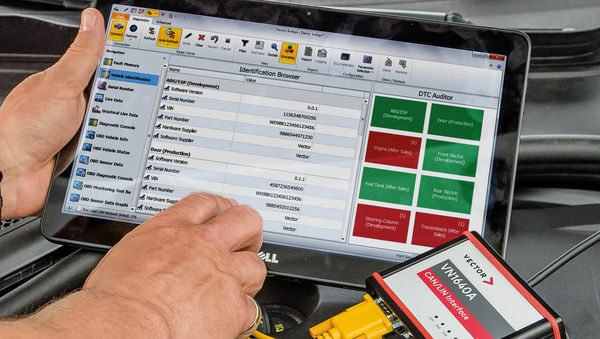 OBD tools: Readout and evaluation of different fixed OBD data across different OBD standards (OBD II, WWH-OBD or HD-OBD), such as vehicle info, vehicle status, monitoring test results, vehicle in-use performance tracking, sensor data, sensor data graphic. DTC Browser (OEM specific, J1939 and OBD): Detailed display of the identified DTCs with their status flags, environmental data and error conditions. DTC Inspector: Overview of all DTCs supported by the ECU with color coding of the DTC status. Diagnostic Console (OEM specific, J1939 and OBD): Manual execution of diagnostic services from the diagnostic description file. Script Runner: Convenient recording and execution of repetitive diagnostic sequences and creation of vFlash Custom Actions. The C#-based scripts (VDS) can be reused in all Vector Testing Tools with diagnostic functionality (CANoe, CANape ...). Reprogramming: Execute vFlash Pack&Go projects. A vFlash license has to be available. Trace window: Cross-tool display of sent and received diagnostic telegrams (including interpretation) - specially adapted for diagnostics. The contents of the trace window can be saved as a log file for later analysis. Indigo Remote is the remote diagnostic solution that allows an expert to directly and interactively diagnose any vehicle anywhere in the world with immediate access. This shortens diagnostic and repair times, resulting in significant cost savings. High data security: Diagnostic data, processes and safety algorithms are not required on site and are therefore not transmitted. With Indigo Remote starting version 4.0 and higher, Indigo supports interactive remote diagnostics. An expert on a PC conducts a remote diagnostic session with a special ID or password. Communication takes place via a secure Vector Remote Server. On the vehicle side it is sufficient to start the access point and forward the access data to the expert. No changes to the vehicle are necessary and the software for the access point can be downloaded here free of charge according to your contact details. This means that Indigo is immediately ready for use in cas of need. As an alternative to the PC and network interface for vehicle access, the Intelligent Diagnostic Device VN8810 is also available. The compact device from Vector has an integrated interface (CAN(FD), K-Line, Ethernet) and can easily be equipped with the Indigo Access Point Compact via the Vector Platform Manager. The Indigo Access Point software (PC) and Indigo Access Point Compact (VN8810) required for local access to the vehicle are part of the Indigo delivery. Both can be quickly installed without admin rights. With Indigo Remote, diagnostic data, test sequences and security algorithms remain in a secure environment - all control, interpretation and evaluation takes place on the expert computer. Together with end-to-end encryption via the Indigo Remote Server, high data security is guaranteed. A number of technical measures ensure high bandwidth and low latency so that the full scope of diagnostics can be used efficiently. This makes it possible to access vehicles worldwide with very short response times - even when transferring large amounts of data. Indigo Remote can be used anywhere whenever an expert needs direct access to a distant vehicle for remote diagnostics. Vehicles on test runs: During a test drive, a vehicle exhibits unusual behavior only under very specific conditions. A precise examination by an expert or system developer is needed. In very few cases, this expert is on site and can use vehicle diagnostics to read out important vehicle data and control actuators for testing purposes. With Indigo Remote, the expert can now access the vehicle directly, despite being very far from the site. Vehicles in offshore production plants: Indigo Remote offers short-term support from remote developers for problems with the vehicle, system or ECU. Thus, both OEMs and suppliers can use remote diagnostics to diagnose their systems quickly and securely during start-up phase in a production plant. Customer vehicles in the service shop: At service shops, there are sometimes situations that require consultation with an expert. For those, Indigo Remote offers prompt help from “vehicle doctors” or developers from the headquarters if an unexpectedly complex problem arises. This makes it possible to provide customers fast and cost-efficient repairs.